33-year-old Aung La N Sang is Myanmar’s most successful athlete in history, whose impressive submission skills have earned him the moniker of ”The Burmese Python”. Born in Myitkyina in the mountainous Kachin State, he belongs to an ethnic minority known as the Kachin. 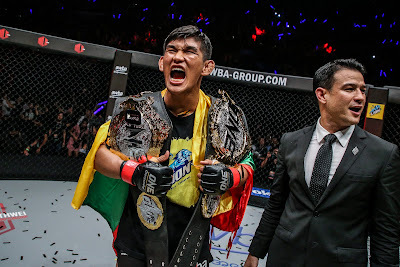 Aung La N Sang captured the ONE Middleweight World Championship with a unanimous decision victory over Vitaly Bigdash in June of 2017. In his most recent bout, he defeated Brazil’s Alexandre Machado to be crowned the new ONE Light Heavyweight World Champion. Next up, Aung La N Sang will defend his middleweight title against Ken Hasegawa. 31-year-old Ken Hasegawa of Kanagawa, Japan is a martial arts veteran set to make his ONE Championship debut. The middleweight contender has finished three of his last five opponents, showcasing the undeniable submission skills and thunderous knockout power that he has become known for competing in Japanese martial arts promotions Deep and Rizin. With a professional record of 16-2-1, which includes four submissions and six scintillating knockouts, Hasegawa will step into the ONE Championship cage for the first time at ONE: SPIRIT OF A WARRIOR. He is set to challenge Aung La N Sang for the ONE Middleweight World Championship.